Wow — 25 years. That’s how long Your Cat Magazine has been gracing the newsstand and been the go-to publication for cat owners. It’s hard to believe that a quarter of a century has passed but, at the same time, I’m sure some of you can remember picking up that first issue! Take a walk down memory lane and check out the spreads featured on the right, from the first mag, May/June 1994. It’s now coming up to a year that I’ve been editor of this fantastic publication, and I know that many of you loyal readers will have enjoyed a much longer relationship with the mag than I have, seeing it evolve over the years. But what’s even more fascinating than Your Cat’s 25-year history is just how far cats have come in that time. It was really interesting to get the views and insights from some of our contributors and supporters for our lead feature, as they fill us in on the changes they’ve seen in the cat world over the past quarter of a century. What struck me most was resident behaviourist Kim Houston’s comment about her family and friends thinking she had gone completely mad when she told them about her newfound career all those years ago. Thank goodness times have changed, and cats are gaining the respect they deserve — and us owners are taken more seriously, with many behaviourists, vets, and scientists continually striving to know more about the cat as a species. 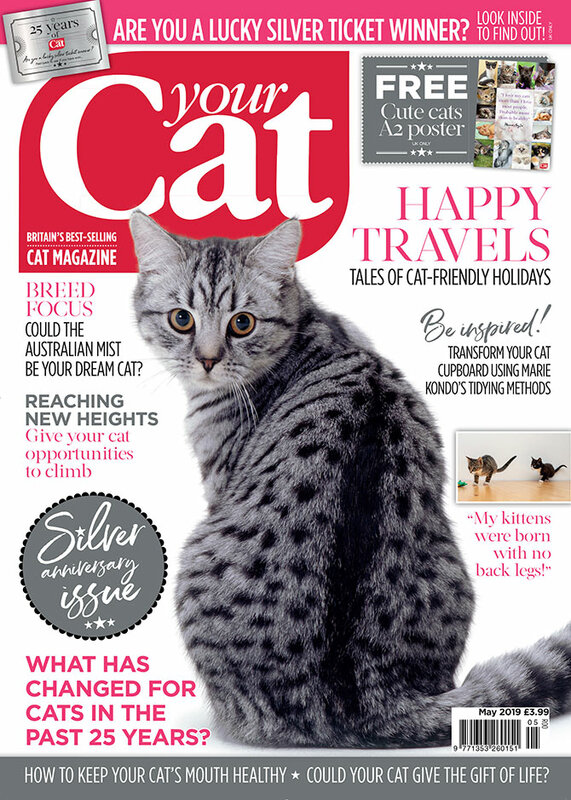 To celebrate Your Cat’s silver anniversary, we have also launched a fantastic competition in this issue. Twenty-five of you lucky readers will find a winning silver ticket in this mag, and get your paws on some awesome prizes. Turn to page 51 to see if you’re a winner — go, go, go!